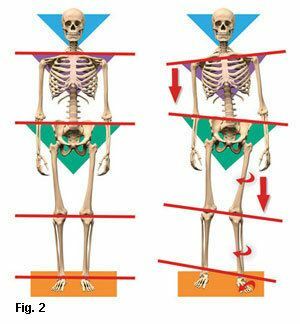 According to the Scoliosis Research Society, degenerative spine disease is one of the most common reasons adults develop scoliosis.1 The greater the degree of deformity, the greater the unrelenting force of gravity (14.7 pounds per square inch) drags on the body’s bony framework (Fig. 1). In the severely deformed, eccentric force distribution produces compensations that travel throughout the neuromyoskeletal system (Fig. 2). Curiously, some scoliotics present with disability and pain, while others with similar degrees of spinal curve sail through life burdened with only occasional discomfort. When assessing medically diagnosed lumbar or thoracic curvatures, the first order of business is to determine whether the misshapen spine is a fixed (structural) scoliosis or a less-serious functional scoliosis, or a little of each. A nonstructural or functional scoliosis is usually treatable and results from compensations such as a short limb, torsioned pelvis or cranial imbalances. 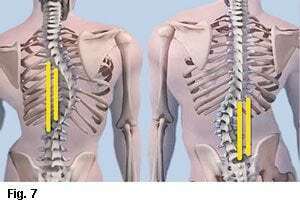 Manual therapists often shy away from treating seriously malformed spines, and for good reason. In the absence of a basic understanding of spinal biomechanics, soft tissue work may not produce the desired results. Moreover, treatments that are too “heavy-handed” may even exacerbate the client’s pain and disability. Yet, one thing I’ve noticed in many years working with scoliotics is this: There is always a functional (fixable) component to every structural (fixed) scoliosis. The simplest way to ‘weed-out’ functional from structural dysfunctions is with the Adams test. Stand behind the client and ask her to slowly forward bend with relaxed arms hanging freely. Keeping your eyes in line with the client’s back, carefully observe for any changes in shape of the thoracic and lumbar spines. Compared to the standing position, does the convex hump change, get worse, or diminish? 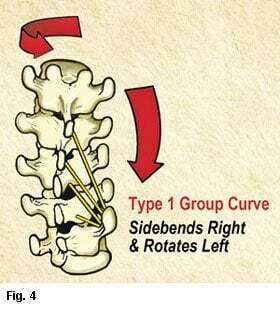 If the curve stays the same or gets worse, some of the vertebral joints (and possibly ribs) are fused (Fig. 3). When treating a structural scoliotic spine, the therapist uses one arm to grasp and lift the client’s torso and the other palm to gently spring the vertebrae above and below the rigid hump (Fig. 5). As seen in the Adam’s test, there will be some available movement above and/or below the twisted vertebrae. Although, the mobile vertebral segments appear to be part of the rigid deformity, they have not yet ossified and are simply “along for the ride.” These are critical areas to target in your treatment plan. Begin myofascial work using extended fingers or forearm to hook and scoop the lumbar and/or thoracic erectors up onto the scoliotic convexity (Fig. 6). Next, dig extended fingers into the lamina groove on the concave side and push the shortened (guy wire) erectors away from the spine (Fig. 7). Because scoliosis is a three-dimensional problem, always look for patterns. For example, when observing the standing client from the front, notice how one shoulder is lower than the other. Look for an oblique crossing pattern traversing from the external obliques and pectoral fascia to the contralateral hip. Use any of your favorite myofascial, deep tissue or assisted-stretching techniques to bring length to the front line. 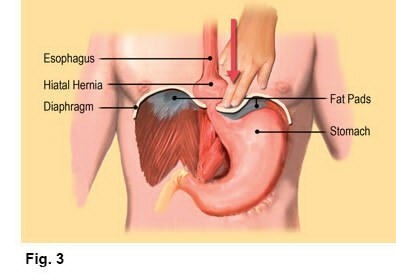 Scoliotic clients will always present with length-strength muscle imbalances. The resulting asymmetry is thought to affect posture, appearance, pain tolerance and, in more severe cases, the ability of the lungs to function to their full capacity. In my experience, strategically designed manual, movement, and cognitive-based therapy modalities work beautifully together to help stop a Type 1 group curve from progressing. Travell, J. (1962). Papers of John F. Kennedy. President’s Office Files (doi: JFKPOF-067-0030). Boston, MA: John F. Kennedy Presidential Library and Museum.